In 01970 John Conway developed a computer program called The Game of Life. The idea behind it was that the process of biological life is, despite its apparent complexity, reduceable to a finite set of rules. The game is made up of a grid of squares, or “cells,” in one of two states: “alive” or “dead.” A player sets the initial conditions, choosing which squares should be alive. Each turn of the game is like a generation – some squares live, some are born, and some die. Just a few simple rules determine cells’ behavior: Cells with too few or too many neighbors die. Empty squares with the right number of neighbors come to life. This simple set-up, played out by the computer over many generations creates vast complexity that is hard to watch without thinking of life. And, in fact, in 02010 a structure was created within the game by Andrew Wade capable of reproducing itself, much like the real-life molecules that eventually lead to all the living creatures on earth. The rules in The Game of Life are much simpler than real-life’s actual rules (which we’re a long way from understanding in full), but the point stands that simple rules can produce a shocking amount of complexity and even the possibility of one of life’s hallmarks: reproduction. 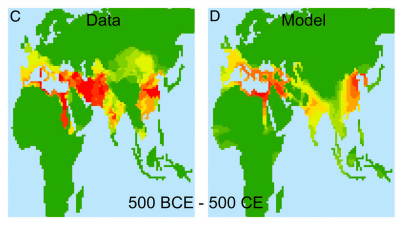 … they divided all of Africa and Eurasia into gridded squares which were each categorized by a few environmental variables (the type of habitat, elevation, and whether it had agriculture in 1500 B.C.E.). They then “seeded” military technology in squares adjacent to the grasslands of central Asia, because the domestication of horses—the dominant military technology of the age—likely arose there initially. The simulation’s predicted history was about a 65% match to actual history, which is a pretty striking result – consider that a coin-flip has two possible outcomes and you’d therefore be able to correctly predict it half the time. Turchin’s model divided Africa and Eurasia into 100km squares – tens of thousands of them. They sampled each square 1,500 times – every 2 years for 3,000 years – assessing sociality and military technology, ultimately allowing the system as a whole to potentially produce on the order of a hundred million outcomes. That their model matches reality more than half the time isn’t a lucky coin-flip – Turchin and other ecologists have been doing this for animal populations for quite some time. It’s also not Asimov’s Psychohistory, but like The Game of Life, it shows that seemingly complex behavior, be it molecular or societal, can and will increasingly be mathematically modelled and predicted.